VYV develops video display technologies to serve the purpose of art and entertainment. Their products are great for shows, concerts, performances and large scale installations. 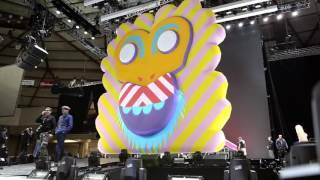 For the show featured in the video, they had to face quite a technical challenge: projecting high resolution videos on two 30-feet high inflatables while tracking their deformation in real-time. Photon tracks key points on the surface to provide a seamless projection which appears to stick to the massive structures, wrapping them in vivid colours and lively graphic video content.